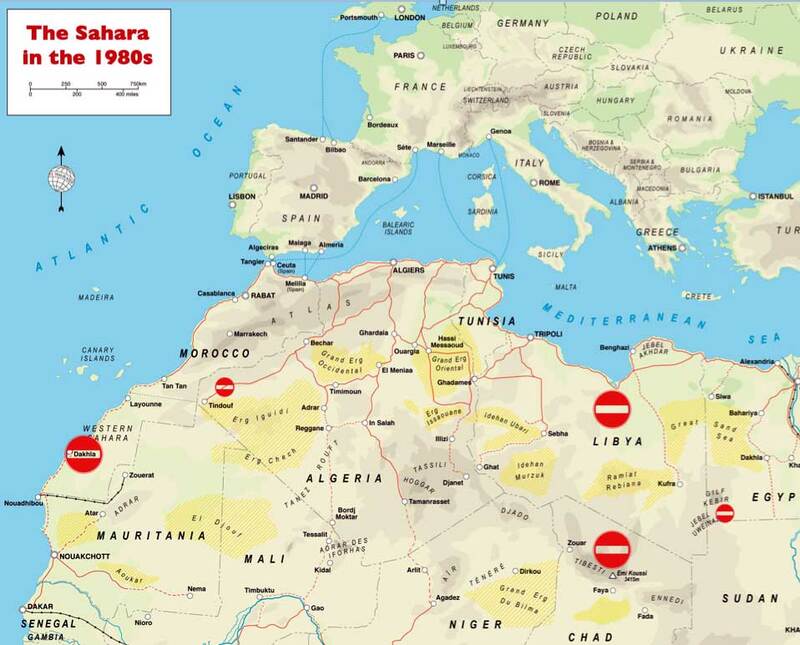 Since 1982 I’ve travelled in the Sahara using motorcycles, 4x4s, regular cars, trucks, and with camels, adding up to nearly 50 visits. I’ve written books, presented talks, appeared on TV, organise and lead tours, shot films and offered advice and consultation to novelists, TV, world-leading brands, NGOs, nutters and scientists. to interests me, be it Arawan, Burials, the 2CV survival story or the mysterious Merkala Tower. It’s a jumble of stuff dating back decades right up to the latest news. Overlanders’ Handbook 2 (right) Adventure Motorcycling Handbook 7 and a full-colour edition of Morocco Overland 3 (above left). I also republished Desert Travels (see below left), a travelogue covering my early adventures in the Sahara when the desert was much more accessible, and recently extracted and expanded the camel section from Sahara Overland into an inexpensive Sahara Trekking ebook (right). 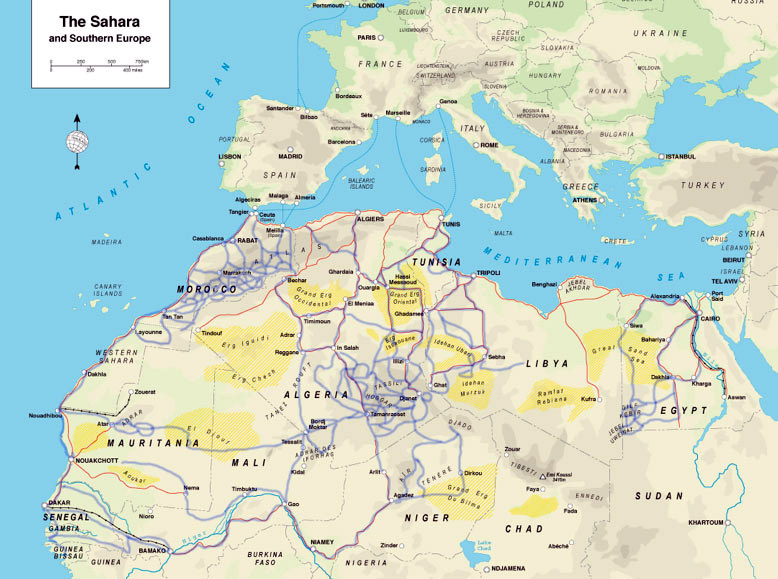 Today, following over a decade of kidnappings, much increased trafficking, rebellions, revolutions as well as the spread of looted weaponry from Libya, independent tourism in the central Sahara has pretty much collapsed or is severely restricted. But it wasn’t always like that. The 1980s were a Golden Age for desert tourism: post-colonial nations had yet to be beset by internal strife, while the popularity of the Dakar Rally as well as the emergence of desert-capable motorcycles and 4x4s, saw adventure tourism flourish in the central Sahara. Most winters the overlanders’ campsite in Tamanrasset was packed with VWs, Land Rovers, Ladas, BMWs and XTs. The last time I stayed at Camping Dassine in Tam it was deserted. Only the old ‘airstream’ Transsaharienne bus (left) rested where it’s done by the entrance gate since time immemorial. Make no mistake: the good days of roaming free around the Sahara are well and truly over. It was great while it lasted but you could say the Sahara has returned to what it always was: a lawless wilderness into which outsiders ventured at their peril.